Cotoneaster frigidus 'Cornubia' is a lovely arching, semi-evergreen tree with long, pointed leaves glazed with a good mid/dark green colour. In June-July, masses of fluffy, white corymbs of flowers appear that are extremely attractive to bees and insects due to their strong, floral scent. In the autumn, a huge crop of eye-catching, red berries develop, creating a lovely, long-lasting display. 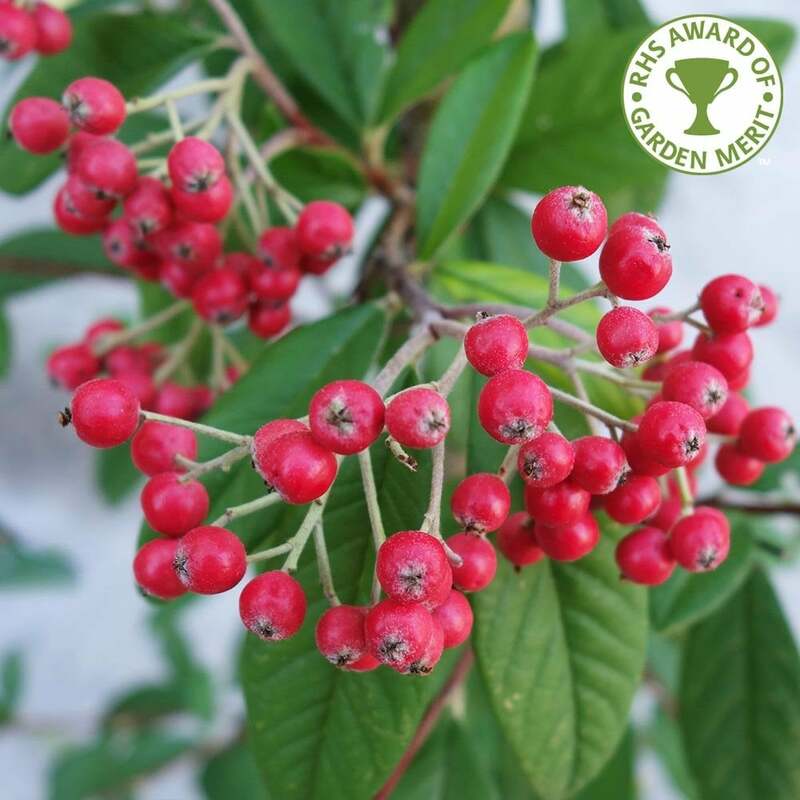 Forming a tree with a height and spread of around 6 x 4 metres in 20 years, 'Cornubia' has received the RHS Award of Garden Merit and makes a wonderful addition to any garden. Being semi-evergreen means that only the very harshest of winters will cause this Cotoneaster variety to lose its foliage cover. It will tolerate most conditions including exposed and coastal positions, as long as there is well-drained soil and sun or semi-shade. Our pot grown Cotoneaster Cornubia tree can be planted at any time of the year. Start by removing weeds and grass within a metre of your desired planting hole. Dig a square hole as deep as your root mass and approximately 2x as wide. To help your tree establish more effectively, sprinkle root grow in the hole. Gently loosen the roots and place into the planting hole. Mix 50% of the original soil with 50% high quality compost, fill in the hole and firm around gently. Make sure not to bank the soil up around the collar of the tree. We recommend using a stake and tie kit and if your area is pron to rabbits, a rabbit guard. For further information see our planting guide. If you’re planting in spring or summer, water well and regularly for the first few months. Make sure to keep an eye on young Cotoneaster Cornubia trees and increase watering if there are extended periods of hot or dry weather. If you’re planting in autumn, you may only need to water your tree a little. We stock a range of irrigation kits, suitable for a variety of planting schemes. Cotoneaster trees and shrubs do not need a lot of pruning. Just trim any overly long or wayward branches. Any branches that are trailing toward the ground should also be removed as they can take root and form a separate tree. If you want to control the overall size of your cotoneaster tree, it can handle hard pruning. It can either be cut right back, or if you don’t wish to be that severe, remove 1 in every 3 branches, selecting the oldest each time. Pruning can be carried out at any time of year, but the dormant season (autumn to winter) is preferable.